These mini monster cakes are so easy to make, my 5-year-old did quite a bit of the work. And hey – everything is cuter when it’s miniature! They’ll make a perfect addition to a monster party or a Halloween get-together. I’m feeling a bit snarky today, y’all, which means this recipe might be filled with sarcastic goodness. It’s also packed with the type of awesome one gets when baking with one’s children. Here’s my little one “helping” by taking everything out of the baking cabinet. The cake batter has two things going for it: it’s a small batch and it isn’t too sweet. Candy melts bring PLENTY of sugary-goodness to these mini monster cakes. Whisk together flour, sugar, salt, baking soda, and baking powder. Set aside or give your kid a fork and let them stir until their arm is ‘sore’ (about 45-seconds). 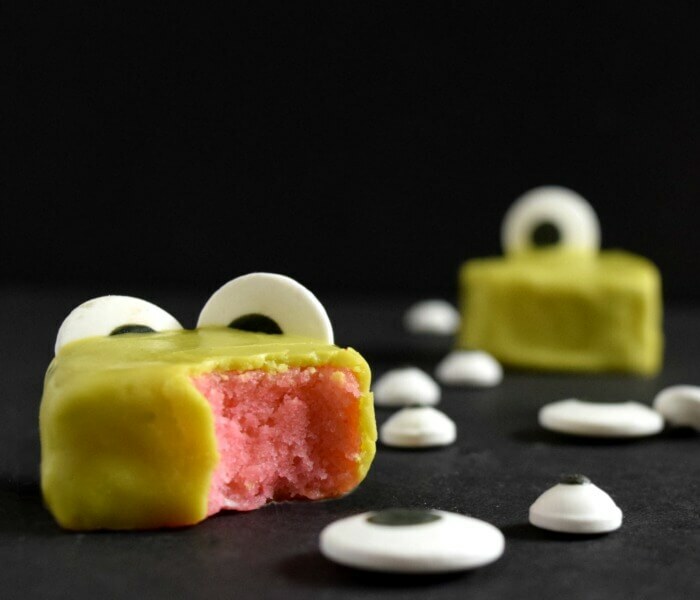 Making monster petit fours is such a great way to get kids in the kitchen! Combine the milk and room temperature-ish butter and microwave until the butter is melted. Add the vanilla (after taking a huge whiff because who doesn’t love the smell of vanilla?!). Add the wet ingredients to the dry and combine. Separate into bowls and add coloring if your 5-year-old is jumping up and down singing, “We’re going to have colored cake!” over and over. Note: to make “unicorn batter,” spoon in different colors. Select any pan (mini or full-size to cut with cookie cutters after baking) and coat it with spray or shortening. Rap the pan on the counter 1,000,000 times because your kid thinks it’s hilarious (and to release all those bubbles). Bake those mini monster cakes at 350 degrees F for about 11 minutes. Remove and cool on a wire rack for what feels like FOREVER (5-10 minutes). Look at these beautiful cakes. Now, let’s talk about how to keep them that way. Before you actually get to the candy melts, do yourself a favor and crumb coat. You’ll need a tiny bit of buttercream icing (homemade or store-bought). Look at that down there – they don’t have to be perfect! It’s just a light layer to trap in any crumbs and even out any air holes. I will advise you to do this step because it makes a big difference in the finished product. “But I just want cake,” says the 5-year-old. I get it. The one in the back is the first pour on a crumb-coated cake. The one in the front was not crumb-coated. It’s a noticeable difference. Pop the crumb-coated mini cakes into the fridge while you prepare the candy. There are affiliate links which means at no additional cost to you, I could make a few pennies to support my crafting habit if you click and make a purchase. 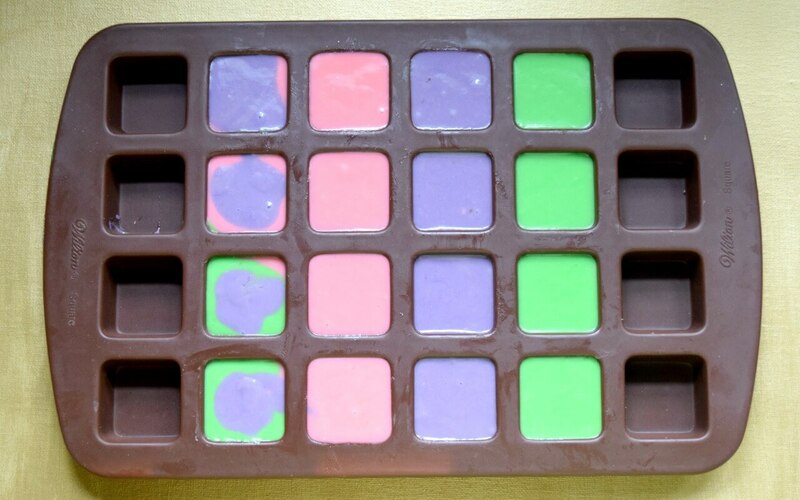 You’ll need one of two things to get candy melts to a pourable consistency: shortening or EZ Thin Dipping Aid. Do not rush the melting. I have this little pot and it’s nice but it was downstairs and I was, well, lazy so I used a double boiler made from a stainless steel bowl atop a pot of boiling water. Melt about a teaspoon of shortening in the bowl and add half a bag of candy melts. Slowly and constantly stir the candy until it pours off the spoon. Take it over to your prepared rack and spoon the mixture over the cakes. Let the kids pop on some eyeballs and Let.Them.Eat.Cake! Note: to make the mini monster cakes into petit fours, stack two on top of each other (or half a single cake) and fill with a cream or jam filling. Then, proceed to crumb coat and cover. These mini monster cakes are so easy to make, my 5-year-old did quite a bit of the work. Whisk together flour, sugar, salt, baking soda, and baking powder. Set aside or give your kid a fork and let them stir until their arm is 'sore' (about 45-seconds). Combine the milk and room temperature-ish butter and microwave until the butter is melted. Add the vanilla (after taking a huge whiff because who doesn't love the smell of vanilla?!). Add the wet ingredients to the dry and combine. Separate into bowls and add coloring if your 5-year-old is jumping up and down singing, "We're going to have colored cake!" over and over. Note: to make "unicorn batter," spoon in different colors. Rap the pan on the counter 1,000,000 times because your kid thinks it's hilarious (and to release all those bubbles). Look at these beautiful cakes. Now, let's talk about how to keep them that way. My daughter called this step, "just another thing keeping me from eating cake." Before you actually get to the candy melts, do yourself a favor and crumb coat. You'll need a tiny bit of buttercream icing (homemade or store-bought). Look at that down there - they don't have to be perfect! It's just a light layer to trap in any crumbs and even out any air holes. 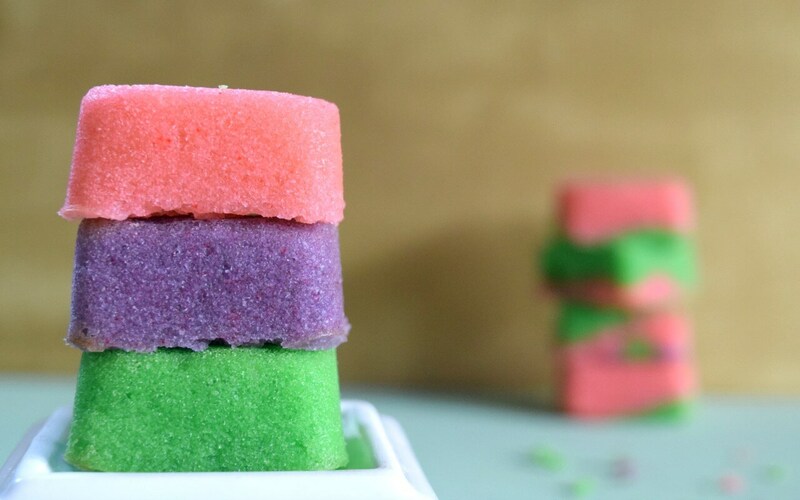 Pop the crumb-coated mini cakes into the fridgewhile you prepare the candy. 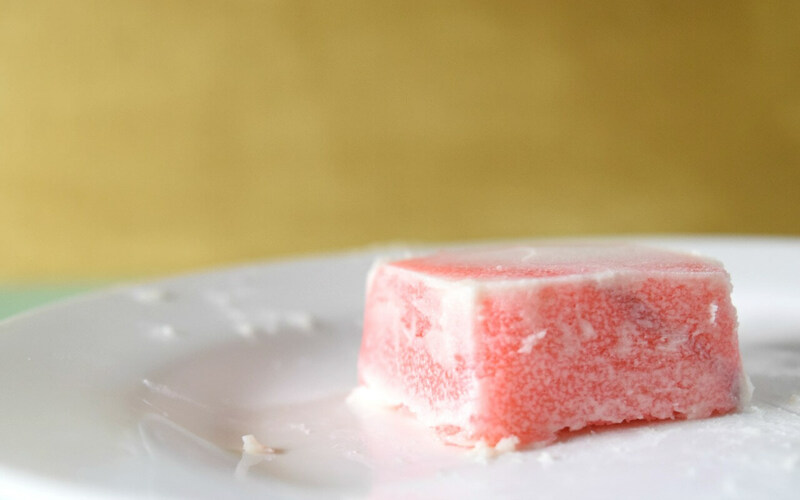 You'll need one of two things to get candy melts to a pourable consistency: shortening orEZ Thin Dipping Aid. Do not rush the melting. Slowly and constantly stir the candyuntil it pours off the spoon. Take it over to your prepared rack and spoon the mixture over the cakes. These were very quick to make, bake, and decorate. My little one loved them and we hope you do, too. In fact, could you please pin this to your favorite party or monster board to help spread the word? For other monster fun, check out this adorable monster wreath (made in a couple of minutes), our favorite monster book, or these tasty monster sugar cookies.